Have you seen the latest Grandin Road catalog? I would really love to just go live in that catalog. So as I was drooling over thumbing through the newest issue, I see these cute insect pillows. I think they are so cool and they make me think of Spring, which I'm so ready for. When I saw them I knew this was going to be my inspiration for a child's rocking chair I found recently. I cut out a new one and glued and screwed it on from the bottom. Oh, and it's a Thomas Pacconi rocker too. BUT I knew I had heard the name before. Googled and all I could find were Thomas Pacconi Christmas ornaments...maybe he (they?) used to make furniture? Don't know. I just found your blog today (i dont think ive been here before,, ha ha),, love that little dog bed and this little rocker is just too cute. Oh my goodness! 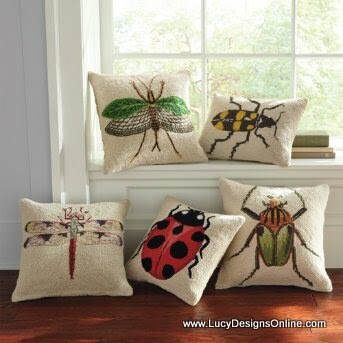 You are toooo talented and I love ladybugs...they were my sororities little mascot so I still love to see them! I love what you do with everything on your blog! I will be following you for sure!! I drool over the Grandin Road catalogs too. Those pillows are adorable, but I really love your rocker! Who wouldn't? What a wonderful curbside find. Blog giveaway at www.theoldblockhouse.blogspot.com for three antique blue half gallon mason jars. Excellent way to liven up the old rocking chair. Looks great.